How do you define your market? Is it by the customers you serve? The product you’re building? Or perhaps the category everyone else uses to describe your product? When it comes to defining a market, a more common approach is to use a product-based market definition. If you’re creating a banking app product, you may simply say you are in the “banking app” market. On the surface, it seems reasonable. It’s obvious to your team, it’s a straightforward way to socialize the same statement across a company, and it’s easy to remember. However, creating product-based market definitions are inherently flawed because products change over time. If you tie your entire your business model to a product with an expiration date, your business will expire with it. Absolutely no company is absolved from this approach, either. For example, Blackberry, Britannica, and Kodak all lost billions of dollars in equity value because they were focused on their products and not the customer’s struggle, or as we call it - the job-to-be-done. As they grew, they became trapped and tethered to the product they built their entire business around. In each case, these companies thought they were in a product-based market. Blackberry thought there was a market for keyboard devices. Britannica thought there was a market for Encyclopedias. Kodak thought there was a market for film. But these are all fatally flawed product-based definitions of markets, because products evolve. This concept is true in any market. In a consumer market, consumers don’t want nav apps, GPS or maps, they want to get to a destination on time. Getting to a destination on time is the customer’s goal and it is therefore a stable job-to-be-done that will not change over time. The correct way to define a market is to focus on a group of people executing a functional job-to-be-done. With jobs-to-be-done, there are no product-based markets. There are no iPod markets, no Maps market. There is only the customer’s job to be done. If you build an entire business around that timeless job, you have a greater chance of innovating on products that can meet the needs of the customer. Now that you have a clear understanding of what a market is, let’s get to the two types of customers you need to address. Within every market (or job-to-be-done), there are two types of customers - job executor and job beneficiary. The job executor, appropriately named, executes on the job. The job beneficiary benefits from that job. 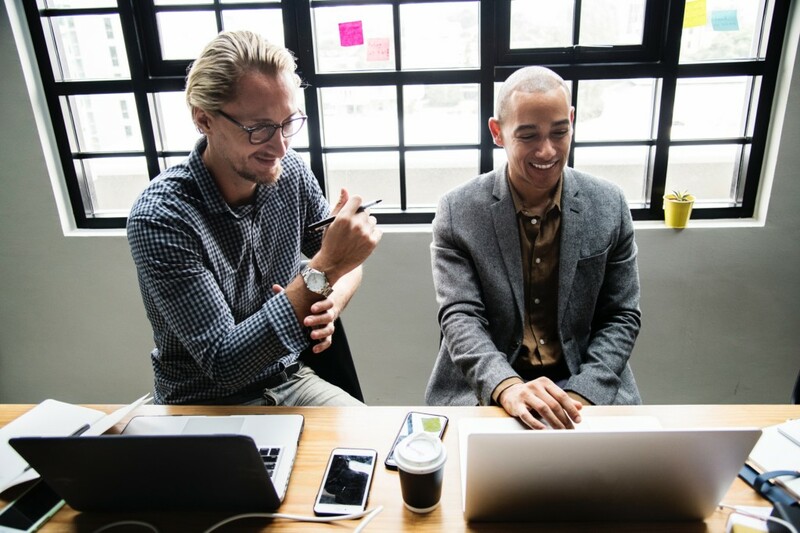 While they can often be the same person, in cases where they are two different people, you must always build your business around the job beneficiary. Why? Because just like a product, markets evolve to remove the job executor. This beneficiary/executor distinction is important because the job executor is currently part of the solution to getting the job done and new solutions will be developed over time to help the beneficiary get the job done on their own without the current executor. For example, cloud-based applications have enabled companies to reduce or eliminate specialized IT managers (job executors) so that non-technical employees (job beneficiaries) can "enable secure data use" on their own. In medical markets, new medical devices have been developed to allow a patient to "obtain a blood sample" on their own without a specialized phlebotomist. In our B2C example, Lyft, Uber, and autonomous vehicles remove the need for consumers to drive themselves. In our medical example, a company called Seventh Sense is building a microneedle array that enables a patient to easily and painlessly obtain their own blood sample without a technically trained phlebotomist. Cloud services and cloud-based applications enable employees to use data securely without an IT manager. This process of removing executors happens in every market. Again, this is why it is critical for your teams to focus on your customer's job and not your product - because customers, the job beneficiaries, are not buying your product, they are hiring it to get a job done. Even in cases where the purchaser is not the job beneficiary, over time, products that get the job done better for the beneficiary will be purchased by the purchase decision makers. As a head of sales, you’ve likely experimented with numerous frameworks for your sales team. There’s also a good chance that you’ve worn tired of the redundant message across all of them. Although these frameworks are helpful in creating a philosophy on why customer needs are important, they don’t give sales teams the content or tactical direction on what the customer needs are and how your solution satisfies them better than competitors. So what’s the missing link? How can you get your sales team to understand the customer need and use that to close more deals? Jobs-to-be-Done. Here’s an overview of how Jobs-to-be-Done helps you fill out the content in your Challenger, Strategic, or NEAT sales pitch and aligns the sales team with the product team. 1. Gain alignment on who the customer really is. In many markets (especially B2B), the distinction between the Job Beneficiary--the person who benefits from getting the job done--and the Job Executor--the person who does the work to get the job done--is critical to understanding the needs of the person you are talking to. The job executor is part of the solution to getting the job done and new solutions will be developed over time to help the beneficiary get the job done on their own without the current executor. Perhaps your solution puts the Job Executor’s role at risk. Raise the notion that she can now allocate time to a higher order task. 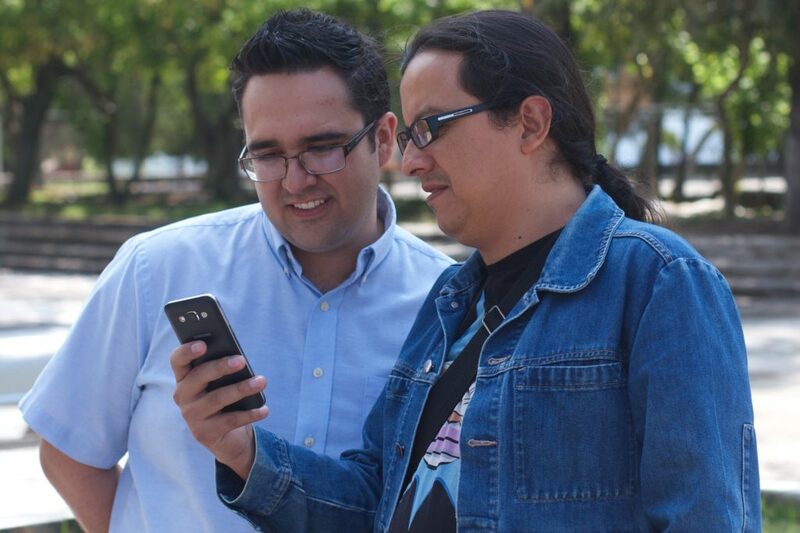 One example of a solution targeting a Job Beneficiary is cloud-based applications. They have enabled companies to reduce or eliminate specialized IT managers (job executors) so that non-technical employees (job beneficiaries) can benefit from secure data use without having to rely on IT. In medical markets, new medical devices have been developed to allow a patient to obtain a blood sample on their own without a specialized phlebotomist. Once you have defined your target customer as the Job Beneficiary or Job Executor you can better understand who your solution is really for, target them in your prospecting, and tailor your sales pitch. 2. Define the ultimate customer goal (or job-to-be-done). Connecting your product to the goal of your customer is a fast way to connect to the value they want to see from your solution. Framing it as a job-to-be-done is helpful because it in ensures that you focus on their goal independent of technology or a given solution. For example, you don't want to sell AI. You want to sell how AI helps your customer achieve their goal, which actually has nothing to do with AI. They had this goal before AI and the will still have it when the world is hot on some new tech. What customers want is to be understood and for you to tell them that whatever problem they’re experiencing, whatever goal they want to achieve - your product is going to do what they need it to do. The end. By getting to the heart of their goal, you’re able to have a more natural, empathic conversation during the sales call. Customers are more likely to open up and discuss their unmet needs. You are there to empathize with their struggle and provide real value. Tip: Once you’ve discovered the JTBD, share a similar success story. Focus on developing a hero (previous customer) who overcame the same struggle. Highlight how you helped them do it faster, more accurately and worry-free. Include metrics and proof points of how you helped this customer get the job done. 3. Avoid the feature-to-feature comparison trap. When a product team strives for feature parity with a competitor, they are in the follower's position. If you've ever been on a team that is playing feature catch-up, you know it's like bailing water out of a leaky boat: every time you release a feature and think your work is done, your competition releases something new, racing ahead of you yet again. Microsoft thought they caught up to the iPod by including all of its features in the Zune. Apple launched the iPhone. Microsoft tried to catch up again with the Windows Phone, but playing catch-up leads to failure. Feature to feature competitive analysis often fails to identify new competitive threats that can emerge from a different category of products or services. Encyclopedia Britannica thought they were competing with other collections of books and failed to realize how CD-ROMs (and eventually the Internet) could upend their business and lead to their failure. If a customer asks if you have a particular feature, guide the conversation back to the unmet needs they have and the job they are needing to get done. Keep the conversation grounded in what’s most important to them, and the features will become less important. 4. Create a successful alignment with the product team. Developing a Jobs-to-be-Done framework for your teams is critical in not only providing your sales team with the right structure to close deals, but it also provides them with the right language to collaborate more productively with the product team. Sales and product teams have long been on opposing forces within an organization. Sales is unsatisfied with the lack of new features they can sell and product is unsatisfied with the lack of support and quality feedback they are getting. It’s an age-old battle that will continue as long as features stand at the center of product development and selling. However, when teams are aligned on the Job-to-be-Done, there is more clarity on what provides real value to customers. Creating a Jobs-to-be-Done strategy allows for product teams to build a roadmap that is customer-focused and sales teams a more guided framework on how to sell the product. Instead of going back and forth on customer demands and new features, with JTBD sales teams will be able to validate and the job and product teams will have more data that falls in line with their roadmap. Jobs-to-be-Done is not a strategy just for product teams. Implementing JTBD across sales and marketing teams allows your entire organization to develop a cohesive language they can share that is customer-focused and memorable. If you want to learn more about how to train your teams on JTBD, check out our services, software, or online training course. I wanted to post a longer explanation here (given twitter’s limitations) in order to clarify what I meant and hopefully provide some useful insights for UX designers and product teams. UX is obviously incredibly important because good UX contributes to customer satisfaction and customer satisfaction drives equity value. The number one goal of every product, marketing and sales team is to create equity value. Teams that don’t create equity value ultimately get fired and companies that don’t create equity value go out of business. So what is UX Design? First, let’s distinguish between two different types of customer experience: non-immersive and immersive. In this post, I will be focusing on non-immersive examples. Immersive experiences are where a user wants to use the product over a period of time. For example, playing video games, watching television or listening to music. In these cases, the user is looking to use the product in-and-of-itself (video games, tv shows, songs). They want to spend time with it. In non-immersive experiences, which I will focus on here, the user wants the experience to be over with as quickly as possible. For example, getting to a destination on time, optimizing health with diabetes, acquiring customers, and finding tv shows to watch are all goals that people (customers) have. But people don’t want to spend a significant amount of their valuable time doing any of these things. They want to achieve the goal as quickly as possible and get back to their lives. A quick logical test proves that this is true. Let’s say you designed a product (and user experience) to make getting to a destination on time slower or a product that made finding a tv show to watch slower. Would your product succeed against the competition? The answer, of course, is no, not likely. This is also true for accuracy: your customers want to achieve their goal as accurately as possible. For example, let’s say your product was less accurate at getting people to a destination because it didn’t always get the address of the destination correct (as happened with the first version of Apple Maps). Would your customers be satisfied with the product? Again, the answer, is no, not likely. Your customer’s goal is an example of what is now known as a “job-to-be-done” or JTBD. But for the sake of this discussion, let’s put JTBD and its terminology to the side for now. Your customers have a goal to achieve that is independent of your product. Your customers want to achieve their goal as fast as possible. Your customers want to achieve their goal as accurately as possible. In addition to these principles, it is also true that every customer goal is complex. This is because to achieve any goal, customers have to take actions and identify variables required to achieve the goal. 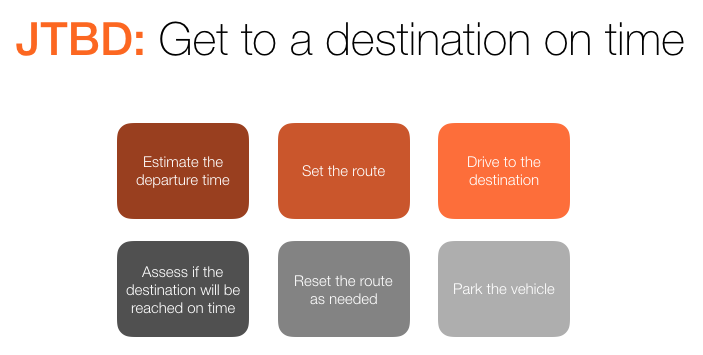 For example, if you are going to get to a destination on time, you have to know a lot of information (i.e. variables): what are the possible routes, what is the required departure time, what are the traffic conditions on the routes, what is the total travel time, etc. And you have to take actions including making decisions: e.g. determine the departure time, determine the optimal route given the traffic conditions, determine the arrival time for a route, etc. A product that helps customers take actions and make decisions quicker than competitors and that helps identify variables more accurately than competitors will win in the market by helping customers achieve the goal faster and more accurately. This is a key concept, and it is why any user experience (in non-immersive markets) should be focused on speeding up the steps it takes a user to achieve the goal. Your users don’t want to use your product, they want to achieve their goal. So a UX with fewer steps is the best experience.Hopefully this helps clarify why we view UX Design to be the process of determining the steps required for a customer to achieve a goal (i.e. get a job done). Fewer steps is better, zero (automatic) is best. And hopefully it clarifies, why speed and accuracy of achieving the goal are the criteria to judge the design.I hope this is just the beginning of a conversation about UX Design, and I welcome any feedback and refinements that would help UX and product teams create more equity value for their companies. Digital transformation has executives salivating at the thought of being innovative, however it’s clear many of them have misunderstood what it requires to execute successfully. Last month, Harvard Business Review published an article titled “Why So Many High-Profile Digital Transformations Fail” that highlighted global organizations such as GE, PG&E, Lego and their failed attempts at implementing a digital transformation. The authors, Thomas H. Davenport and George Westerman, examined factors that lead digital transformation projects to fail such as a lack of awareness of customer needs and lack of direction. When companies don’t integrate the digital transformation with their product goals and align it with their customers, they lose sight of their end goal and things go off-track… and quickly. Davenport and Westerman highlight the ongoing failure of large corporations and their shiny object syndrome when it comes to going digital. They couldn't see how to focus the digital changes to their products and operations on delivering value to their customer. It's almost like a digital spray and pray. If they make things digital, success will come, no matter the why or wherefore. Eager to get ahead of competitors, these companies have blitzed through product and operational changes that missed the mark on what’s actually valuable to their customers. So, what is their end goal? What have these companies lost sight of? The goal, within the Jobs-to-be-Done methodology, should always be to get your customer's job done better. You need to make sure everyone at your company knows the customer’s job and how to use it to make great decisions. How should they implement digital technology to get the job done better? 1. Understand the job you are fulfilling for customers today. “Your customers do not buy your product; they hire it to get a job done. The struggle with the job causes a purchase,” says Clay Christensen, author of Innovator’s Dilemma and Competing Against Luck. The first step in understanding the job you are fulfilling today is to understand the goal your customer is trying to achieve. Customers don’t care whether or not your company is digitized; they care about their own lives and their own goals. 2. Identify the unmet needs. When your customer struggles to get the job done, this leads to a purchase. We call this struggle an "unmet customer need." To determine unmet customer needs, we rate the importance and satisfaction of every customer need in the JTBD. Unmet needs in the job are stable, objective, measurable, and precise articulations of customer problems. 3. Figure out what solutions customers hire to get this job done today. You can accelerate your growth by getting people to switch from their existing means of getting the job done to your product. To get them to switch, you need to understand how well their existing solution gets the job done. If you measure how quickly and accurately the customer can achieve their goal with their current behavior, you know what you have to beat. Your objective is to create a new solution that gets the job done faster and more accurately. Need help? Read this article on Competitive Analysis. 4. Determine if these unmet needs can be addressed with digital innovation. Companies who enter a digital transformation that is misaligned with a customer’s job will fail. Making things digital won’t make things better. Remember customers aren’t buying your product because it’s digital or not digital - they’re buying it because it’s helping them meet a goal. Or in the case of Jobs-to-be-Done, it’s fulfilling a job they’re hiring you to do. What do you do when you’ve spent the lifetime of your business focusing on one type of customer and suddenly you realize the market has shifted beneath your feet? Your customers are not who you thought they were, and the value you’ve long provided them is put into question. Do you have to change what you offer? How do you deliver value to this new customer? Why is this new buyer willing to pay? 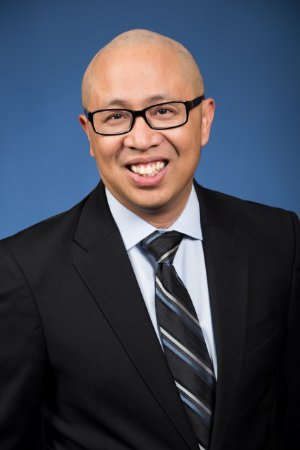 For Elmer Almachar, Senior Director, Strategy and Innovation, Kellogg School of Management, this was the multi-million dollar question. In the past, Kellogg’s enrollment for their executive MBA program was largely supported by company-sponsored tuition. Employees from top global companies would rely on their employer to sponsor them to attend the program, and in the end, the value to the company was that they had a more experienced, well-rounded employee. However, over time the market had changed. Company sponsorships had decreased by 43%, while the number of students paying their own tuition increased by 42%, according to the EMBA Council. Tuitions have gone up, outpacing inflation. Self-sponsorships have increased with them. Full sponsorships have declined. So more students are paying a higher proportion of a larger tuition load—but why? In this interview, Almachar explains how JTBD customer interviews led them to understand their customer and how to serve them better. What was the moment you realized there was a shift in the market? When we saw the industry-wide sponsorship numbers, we knew something was going on. Although we knew that meant a change in how students were enrolling and paying, we didn’t know why it was happening and what that meant for our overall purpose. We had some educated guesses, but we didn’t have the right method in place. All we had were traditional methods which meant all we would get is a traditional answer. We didn’t have anything available to us that could get to the underlying purpose and the underlying motivation—that is until we explored Jobs to be Done with thrv. Before investigating further, how did you view what you were offering students? What was the value before? I would say in some ways we were a bit puzzled. 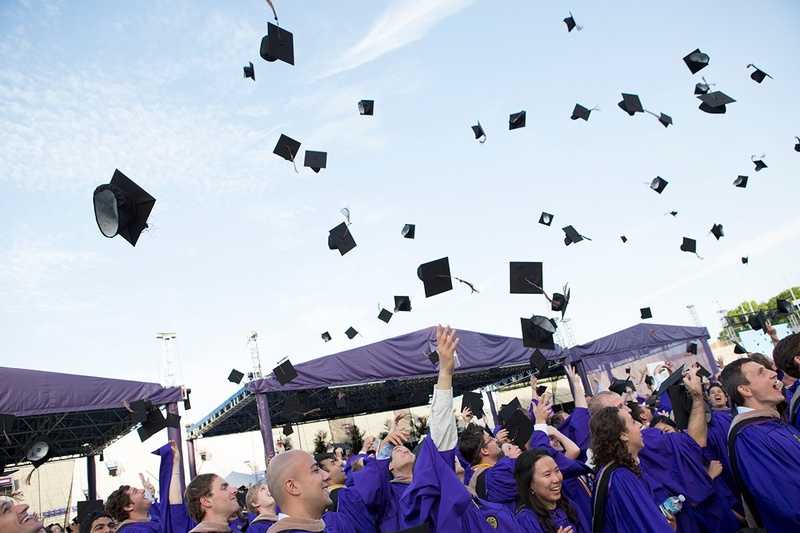 Many EMBA programs emerge out of the traditional MBA curriculum. And so a large part of our program did the same, and you can see how it tilted us toward thinking about the degree in a traditional sense, largely focusing on what students get in class. Obviously, the curriculum is important and we believe that in order to get an MBA there are certain things we have to teach you. However, we wanted to align the overall program more with why they are coming to us in the first place. We’d always thought there was something about their professional trajectory that influenced them to get an executive MBA. But we had the instinct that there was a deeper motivation there, we just didn’t have the method to get at that motivation. What were you hoping to accomplish through your jobs to be done research? We entered into the research hoping to better understand why applicants were coming to us. We could understand why when companies were paying their way; it was likely a part of their professional development plan, succession plan, or trajectory within that company. But when [students are] paying their own way, it’s a bit murkier. The time and opportunity they have to invest just by being a part of any EMBA program is pretty substantial. We wanted to understand what was driving students to choose our program. Framing this in a Jobs to be Done way, our objective was to understand the job that our students are hiring the EMBA program to do for them. That was the heart of the project. What hypothesis did you develop before going into the interviews? We had a lot of hypotheses, which were all focused on career, but we couldn’t nail down what about their career made them apply. Mapping out the potential goals helped us expand how we entered into these conversations with students, and eventually, we realized it wasn’t just about their career. That was too limiting. When you think about a career, you think about changing roles - or getting the next role. And getting into the EMBA program at Kellogg meant much more than changing roles to these students. The students we interviewed were in all kinds of roles, and they were articulating a lot of the same things regardless of what they ended up doing in those roles. Expressions like that got us thinking that it’s not just about career, it’s about their professional life more broadly understood. And oddly enough, that broader mindset was what allowed us to get to the “job” much faster. Understanding the JTBD was "realizing my full potential" was a critical first step, but thrv also showed us how to break down this goal/JTBD to identify unmet needs in achieving this goal. This is what we found really powerful about working with thrv: we can identify needs as metrics which we can measure and act on to help our customers/students. How did thrv help you get to the job faster? Although we had hypotheses, the jobs framework challenged us to think less about our own thoughts and more about what our students really needed. When we asked ourselves “what is the job students are hiring us to do?” our perspective shifted. This was the first time, in my experience, we were asking more open-ended questions like “what was going on in your life when you first thought about an MBA?” We wanted to get to the heart of why they were there and the only way to do that was to remove our own assumptions. A large part of JTBD, and the value it brings is that it disciplines you to ask more open-ended questions and then to see the patterns that emerge. What role did interviews play in your ability to get to - and validate - the finalized job? We did 40-50 interviews, whether it was group interviews or individual interviews. We started out with talking to students as well as alumni. We would always have some questions prepared, but we tried to stay open-minded. Our first goal was just to listen and then to see the patterns of what we were getting and the responses. I loved the question, “When did you first think about getting an MBA? What was happening in your life?” That’s a great entry point, because a lot of times, by the time they apply they have already established a narrative for themselves in preparation for telling us what their story is. They’re preparing to be a successful candidate. But when you go back and say, “what was going on in your life, what was the trigger point, the moment” - you get a little deeper into what was actually going on. Whether it was a pivot in their life, or they were responding to self-recognition. When speaking in retrospect, people are more likely to be honest because they're not trying to sell themselves. My mentor told me to do this. I’ve always wanted an MBA, I’ve just never had the time or the courage. I wanted to be a part of the business side of my company. I felt like there was something more. I didn’t know what I wanted, I just knew I didn’t want what I was doing. That led us to this idea that we were fufilling the job of helping our students realize their full potential. It was really the interviews that allowed us to recognize the patterns and helped us identify the particular job. As we probed, it was amazing and striking how many times a student came to their own “aha” moments about their own motivations. It was almost like therapy for a service industry like ours. And when they express their own “aha” moment - that’s when you know you’ve hit something deep. That’s when you know you’ve connected with that “job”. After recognizing and validating the job of “realizing my full potential,” the next step, is figuring out the best way to help them get there. We feel we’ve finally found the real purpose of our program - not just to be the best teachers, but to help guide our students through that journey. You can use Jobs-to-be-Done to learn from your customers and measure a new product idea before building anything. Iterate i.e. return to the build phase. The assumption is the best learning occurs when people use your product. So, you build, measure, learn, and then repeat. The primary benefit is getting customer feedback and learning if an idea will work before it “gets too far,” i.e. before significant resources have been sunk into a product that customers never wanted in the first place. We all know that building an MVP no matter how minimum it is, will never be free. And anyone who has tried to build an MVP, especially at a big company, has likely suffered from MVP-scope creep. Suddenly, people start calling the MVP “v1” and are asking engineers to participate in its development. And while they’re at it, they get marketing to whip up some creative to drive users to the MVP. The costs balloon. 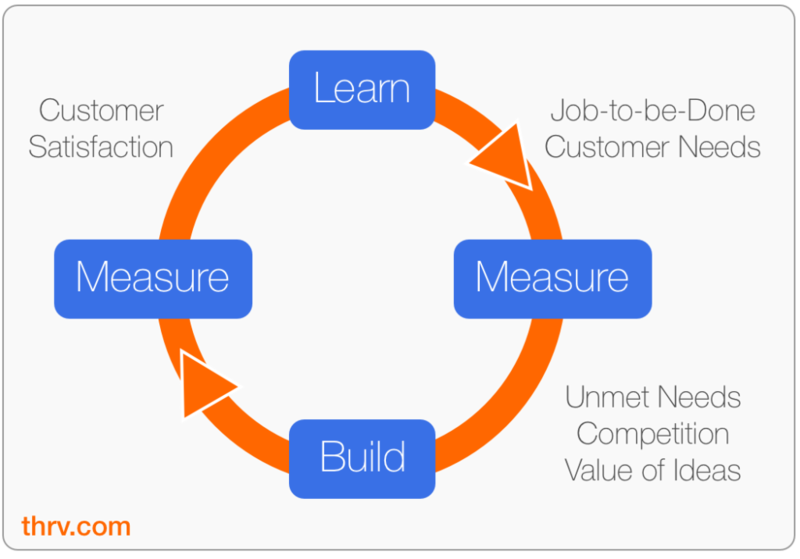 The next frontier in decreasing the cost of product development and mitigating the risk of failure in your business and your role is to measure and learn from customer feedback before building anything at all, even an MVP. Jobs-to-be-Done enables you to measure the likely results of an idea before the first line of code is written or the first pixel of a design is placed. Determine what job customers would hire the product to do. Determine which needs in the job your product idea satisfies and if those needs are unmet. Compare how quickly and accurately your new idea satisfies the unmet needs to how quickly and accurately the existing solutions satisfy them. What job would customers hire the new product to do? “Your customers do not buy your product; they hire it to get a job done. The struggle with the job causes a purchase,” says Clay Christensen, author of Innovator’s Dilemma and Competing Against Luck. The first step in measuring your product idea is to identify your customer’s job, in other words, the goal your customer is trying to achieve. Sometimes the goal is obvious. Salespeople want to acquire new customers or close new business. When it’s not so obvious, customer interviews can reveal the job-to-be-done. A job is has a clear goal, an action verb, and direct object e.g. “get to a destination on time,” “acquire new customers,” or “create a mood with music.” Your customer is the subject of the sentence, not your company. No solutions. Products, solutions, and technologies change over time. To maintain a stable target for your team, keep them out of your job definition. Identifying the job-to-be-done is the first step in learning from your customers before building. Does your idea target an unmet customer need? Once you’ve identified your customer’s job-to-be-done, you need to identify their struggle i.e. their unmet needs in the job. Does your company agree on what your customer’s needs are? In Jobs-to-be-Done, we define customer needs as an action a customer must take using a variable required to get the job done. One way to think about customer needs is the actions that must happen quickly and accurately for the job to be executed successfully. If your decision to take an alternate route does not happen fast enough to take the route or you choose the wrong route (the decision is inaccurate), you will not get to the destination on time. You can measure the speed and accuracy of customer needs in Jobs-to-be-Done, and the measurable needs are the foundation of measuring before building. The measurement begins by determining which needs are unmet. After interviewing customers to validate your list of customer needs in the job, you can run a survey asking customers which needs are important and not satisfied and their willingness to pay to get the job done. The interviews are learning from your customers. The survey is measuring. Needs that have high importance and low satisfaction are unmet. The survey gives you quantitative evidence of what percentage of customers find the need to be unmet and whether or not they are willing to pay to have their needs in the job satisfied. The Jobs-to-be-Done survey measures whether or not a problem is worth solving. For example, before Waze launched we conducted a survey for the job “get to a destination on time.” The highest scoring unmet need in the results was “determine if alternate route should be taken due to unexpected travel conditions.” Waze satisfied this need and enjoyed accelerating growth. Once you identify the unmet needs in the job-to-be-done, you need to determine if your product idea is targeting one of them. This is a major learning moment--you learn if your idea is solving a worthwhile problem or if it is a solution in search of a problem. And you have learned this before building. Assuming you learned in step two that your idea is attempting to satisfy an unmet need, it’s time to measure if it does so better than the existing solutions. Customers switch to a new solution only when it gets the job done better. Above, we noted that customers want to get the job done quickly and accurately. To pressure test this, consider the following: Are there any goals you have that you like to achieve slowly? Can you achieve them at all if every step you take in the process is inaccurate? Can you think of any successful products that helped customers achieve goals slowly and less accurately than the previous solutions? “Better” is satisfying the unmet need faster and more accurately than the existing solutions. To determine if our solution is good enough to invest in, we first identify competitive solutions, measure how quickly and accurately they satisfy the targeted unmet need, and then compare those metrics to the speed and accuracy of our new idea. The competing solutions aren’t bound to similar products. It’s any product, service or manual solution that customers use to get the job done. Before Waze launched, customers used Google Maps, traffic reports on the radio, and calling a friend to determine if an alternate route should be taken to unexpected traffic conditions. This took a few seconds to many minutes depending on how many variations the user was willing to try. The real killer here was the accuracy. It was so hard to identify alternate routes that people would stop this well before testing them all. Therefore, the decision to take an alternate route or not was often inaccurate. Now, we have speed and accuracy benchmarks: seconds to minutes and inaccurate. Waze’s auto-suggest feature was automatic and instantaneous, enabling you to determine the alternate route before you had to make a turn. Furthermore, it was more accurate because it calculates the variations for the user. The trick is that we can measure this idea before building it by determining how fast and accurate it would be if executed perfectly. If we determine it would be less fast and accurate than the leading existing solution, we have learned that the idea is not good enough and not worth investing in, even at an MVP level. Measured the willingness to pay of the customers: is there a market worth targeting? Learned if our solution is better than the existing solutions and can cause people to switch to it if executed well in the build phase. In short, we have measured and learned before building. Either you will learn that your idea requires more refinement before its worth building anything, even a prototype, or you will have validated the idea and know which features are critical to include in the MVP. In both cases, you have not only decreased the cost of a failed idea but you have also decreased the the cost of success. Now that it’s time to build your MVP, check out this post on how you can integrate jobs-to-be-done and agile workflows. How to Answer The Question "What's the job-to-be-done?" Over a year after the publication of Clay Christensen’s book about Jobs Theory, Competing Against Luck, Jobs-to-be-Done is a much more common topic at companies of all sizes and sectors. As the question, "What's the job-to-be-done?" becomes ever more frequent, confusion around how to answer the question rises. Product managers and executives we work with often wonder if their colleagues know the difference between a good and bad answer. The JTBD should be a simple sentence consisting of an action verb and a direct object. See if it passes the wake up in the morning test. A well-articulated job-to-be-done sets a point of focus that will lead to developing high-growth products. Let’s dig into the criteria in more detail. One of the biggest mistakes is defining “the job-to-be-done” as your company’s job. Of course, companies should have goals, but to hit them, you need to understand your customer. The “job” in Jobs-to-be-Done is your customer’s job. The foundation of the method is understanding your customer will lead to building solutions they value, leading to growth for your company. Your product team’s goal is to get your customer’s job done for them. Instead of asking “What’s the job-to-be-done?” make it standard practice to ask, “What’s our customer’s job-to-be-done?” By asking the right question, your team will get off to a much better start in defining the job-to-be-done. What is a job and why does this matter? A job-to-be-done is a goal your customers are trying to achieve independent of any product or solution. According to Jobs Theory, your customers are not buying your products; they are hiring them to get a job done. Their struggle with achieving the goal causes them to purchase new solutions. In other words, the goal of building new products is to satisfy customer needs better than competitors in your market. For example, a team at Microsoft likely used traditional methods to calculate the size of the "iPod" market at its peak. Apple had sold 200 million iPods at $150. Using traditional methods, this logically appears to be a $30 billion market. Microsoft launched the Zune into the "iPod" market, and it failed dramatically. The problem was that consumers didn't want iPods any more than they wanted records, cassettes, or CDs. They wanted to get a job done. In this case, they want to create a mood with music--a goal that is independent of any solutions and nearly timeless. The "iPod" or “MP3 player” market (like the "cassette" market and the "CD" market) is now rapidly approaching $0. New products have emerged (smartphones, streaming apps) that get the job done better for the customer. The Zune was doomed from the start because Microsoft defined the market incorrectly. They launched a product and used a platform that mirrored the iPod while others focused on the features and platform that would get the job done faster and more accurately. History is riddled with examples of companies that not only failed but missed enormous opportunities trying to satisfy customer needs better for their products rather than satisfy customer needs better in the job. Encyclopedia Britannica lost $1 billion in market cap protecting their position in the encyclopedia business. Kodak went bankrupt thinking they were in the film market. Blackberry lost $80 billion in market cap while satisfying needs in the mobile device with keyboard market. Meanwhile, all three companies missed out on the biggest market opportunities in history. Google, Facebook, and Apple created three of the largest companies in the world in the same markets that Britannica, Kodak, and Blackberry were competing in. The three markets were: find information, share memories, and get jobs done while mobile. These are all jobs-to-be-done that define stable markets. If Britannica, Kodak, and Blackberry had defined their markets as jobs-to-be-done, they would have been on the right track to capitalize on these market opportunities. This is why defining the job correctly is so important. When a team is focused on a stable job, they are released from the constraints and pressure to improve the existing product line. They can now innovate with new technologies and a stable target--satisfying needs in their customer’s job-to-be-done. What makes a good job statement? In short, a job is a goal a person wants to achieve in their personal or professional life written with an action verb, a direct object, and including no solutions. Keep it simple, memorable and objective. A customer’s job should be action driven with an attainable goal tied to it - that’s it. Over-complicating a job puts you at risk of multiple interpretations and assumptions. Get to a destination on time. The sentence needs to be easily repeatable. Everyone at the company should be able to state it whenever asked. This creates a common language that is critical to product success. If the language isn’t clear and direct, you may end up with different parts of the company having different perspectives on what the job is. This can cause a systemic breakdown of communication and eventually, of your product development. They faced a long, boring commute and needed something to keep that extra hand busy and to make the commute more interesting. They weren't yet hungry, but knew that they'd be hungry by 10 a.m.; they wanted to consume something now that would stave off hunger until noon. And they faced constraints: They were in a hurry, they were wearing work clothes, and they had (at most) one free hand. Will everyone at your company remember this entire paragraph? To align your teams, you can dissect this paragraph as follows. The job is “eat breakfast.” The customer (the job beneficiary) is commuters. Eat the breakfast within the physical constraints of the commute e.g. with one hand while driving, while standing up on the bus, etc. Clay also raises the notion of an emotional job at play: “feel entertained while commuting.” This complicates your product team’s situation even further. Are you working on the eat breakfast job for commuters or the commute to work job? If you create a solution where the commuter can eat breakfast before beginning the commute, will you have solved the problem? To stay entertained on the commute, is a podcast a better solution than a milkshake? Does it even matter if the commuter is eating? This is why we break the job down into a short job-to-be-done statement and a hierarchical job map of customer needs. In practice, when you are trying to align teams in a large organization, these short, unambiguous, measurable, and prioritized statements are much easier to remember and create objective criteria for your new solutions. It’s important the job includes a goal with no implied solutions on how someone might achieve that goal. By keeping the solution out of the job, you stay focused on your customer instead of your product or a technology that is bound to change over time. There will be a new technology that can get the job done faster or more accurately, and you want to be the one to adopt it in your solution. Each of these statements can lead a company to believe that their market is a product or technology, which can cause them to miss revolutionary new technologies that win in the market. In the first statement above, the solution is MP3s. If your company is focused on an audio file, what will you do when streaming takes over? “Twitter followers” is the solution in the second statement. Why does anyone want Twitter followers? Perhaps they are trying to acquire new customers or learn from people who share common interests among other solution-independent goals. If your company focuses on helping people gain Twitter followers you are dependent on Twitter and you may miss other ways of helping people achieve their real goals faster and more accurately. Finally, it may be stating the obvious to point out the disruption the internet caused to news organizations who thought they were in the newspaper printing business. Each of these statements focuses your company on stable targets that won’t change with technology. Further, they will give your team the leeway to choose whatever solution will get the job done best for your customers, even if it involves new products. Because people purchase new products when they struggle with a job, it’s best if the goal in the job is important to them. The best markets are made up of people actively looking for new solutions to get the job done because if they don’t get it done, the consequences are painful. One way to check if your job statement sparks the necessary urgency is to run it through the “wake up in the morning” test. This is a basic gut test: do you or anyone you know regularly wake up in the morning thinking, “I really need to get this job done today”? If the answer is “no,” then the job you’ve defined is likely not an attractive market. Consider another example of a job-to-be-done definition from Clay Christensen’s Competing Against Luck: pass the time while waiting in line. Does anyone wake up in the morning thinking about passing the time while waiting in line? Do you know anyone who would be willing to pay to get this done? Here’s another example: park a vehicle. Companies like Luxe and SpotHero are totally focused on parking. Would you invest in them? Let’s try the wake up in the morning test. Why does anyone need to park a vehicle? The reason you park a vehicle is so you can go to your destination. We consider “park a vehicle” to be a job step in this larger job: get to a destination on time. Structuring the job this way can help you identify competitive threats. Who else is focused on get to a destination on time? Uber, Lyft, Waymo, Google Maps, Apple Maps. What happens if Uber and Lyft dominate the get to a destination on time market? Far fewer people will need to park their cars and Luxe and SpotHero’s market opportunities diminish precipitously. The wake up in the morning test can help you define the right level of abstraction with your customer’s job-to-be-done so that you can recognize competitive threats and opportunities. Of course, this is just the beginning. This post does not cover our techniques for identifying the job-to-be-done; sizing the market of the JTBD; selecting markets to target for your short, medium and long-term roadmaps; nor what to do with the JTBD once you have it well-defined. If you’re interested in these topics, feel free to get in touch. If you're looking for ways to improve your Net Promoter Score, Jobs-to-be-Done can help you determine what to do to transform your detractors to promoters. Net Promoter Score (NPS) is an extraordinarily popular and quite effective technique for measuring customer satisfaction for a product or service. A business surveys its customers asking, "On a scale of 0 to 10, with 0 being 'extremely unlikely' and 10 being 'extremely likely,' how likely are you to recommend us to a friend?" The customers who answer 9 or 10 are your "promoters." Those who answer 0 to 6 are "detractors." Your Net Promoter Score is the difference between the percentage of respondents who are promoters and the percentage of respondents who are detractors. The business now has a single number indicating customer satisfaction. Improving the number is likely to improve customer retention and growth--a higher NPS should lead to more referrals. But, how do you know why your detractors won't recommend your product? What is causing their dissatisfaction? And what can you do to your product to improve customer satisfaction? You can use Jobs-to-be-Done to answer these questions and figure out precisely how to change your product to transform detractors into promoters. Why are your customers using your product? To know why your customers are dissatisfied with your product, you need to know why they are using it in the first place. According to Clay Christensen, the Harvard Business School professor who popularized Jobs-to-be-Done Theory, "Your customers are not buying your product, they are hiring it to get a job done." Their struggle to get the job done with their existing solutions leads them to hire a new product that they believe will get the job done better. If the new product does not get the job done better, the customer will fire it. In this context, a "job" is not necessarily an occupation. It's any goal that a person wants to achieve in their personal or professional life. A succinct statement with a clear action verb and direct object e.g. "acquire customers," "buy a used car," or "restore artery blood flow." No solutions in the job statement. 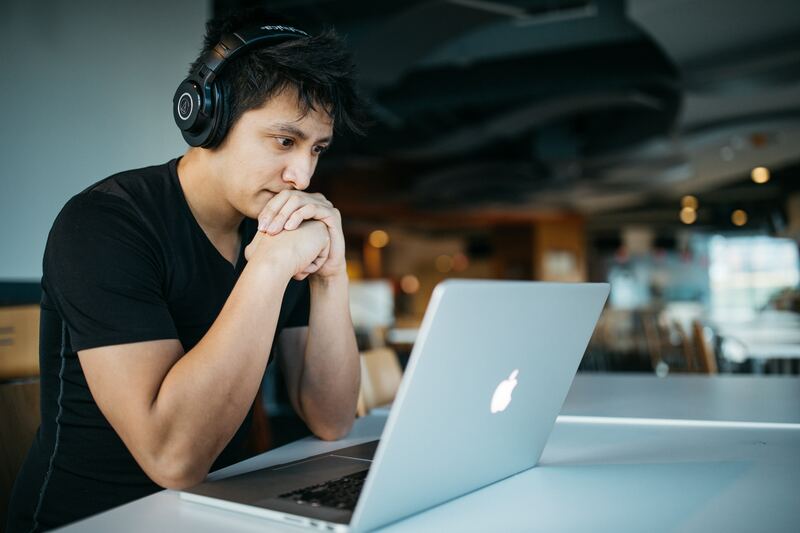 If you include a solution in the job statement such as, "Play MP3s," then you focus your company on a technology instead of the customer and you risk missing big innovations that are possible from new technologies such as streaming music. A job statement should stand the test of time. Take "create a mood with music" as an example. People have been trying to do that since the first noise was made by the first human and will continue trying to do it forever. "Buy a used car" will go away whenever people stop owning cars, but cars have already been around for over a hundred years and will likely last at least a couple of decades more. The projected time horizon of the job's existence helps you determine the level of risk in your market. A large number of people (or at least a small number of people who are willing to pay a lot of money to get it done), should wake up in the morning on a regular basis thinking, "I need to get this job done!" If your job statement doesn't pass this "wake up in the morning" test, it's likely that the job is not important enough for anyone to use a product to get it done better. Sometimes the job (the goal your customers are trying to achieve with your product) is obvious. For instance, if salespeople are using your CRM, it's pretty clear they are trying to "acquire customers" and "retain customers," two clear jobs. Sometimes it is less clear. What job does Slack serve? In such cases, interviewing your customers is a good way to determine the job. You may find your product is being used by your customers to serve multiple jobs. This makes your situation a little more complex and the way to deal with it is another topic for another post. What is causing customer detractors to be dissatisfied? Now that you've figured out what job your customer is hiring your product for, you need to determine your detractors' problem. Why are they dissatisfied? More often than not, their problem is that your product is not getting the job done well enough. Your detractors are not achieving their goal as quickly and as frequently as they would like, and they are blaming your product for not helping them. Let's imagine we're on the product team for Google Maps. Users are hiring our product to "reach a destination on time," among other jobs. Knowing our users blame us for being late to their appointments is not enough information to understand what to build to turn the detractors into promoters. We need to be more specific. Fortunately, we can break a job down to precisely identify where the struggle is occurring and how severe it is in the market. First, we list the job steps, which tell the story of how the job gets done, independent of the existing solutions in the market. All jobs have six categories of job steps. You can hypothesize the job steps in a job by thinking through the last time you tried to execute the job and taking note of what you had to define, prepare, execute, monitor, modify, and conclude. When you find yourself thinking about the products you used to do those things, ask yourself why you used those products until you get to a statement that does not include a solution. 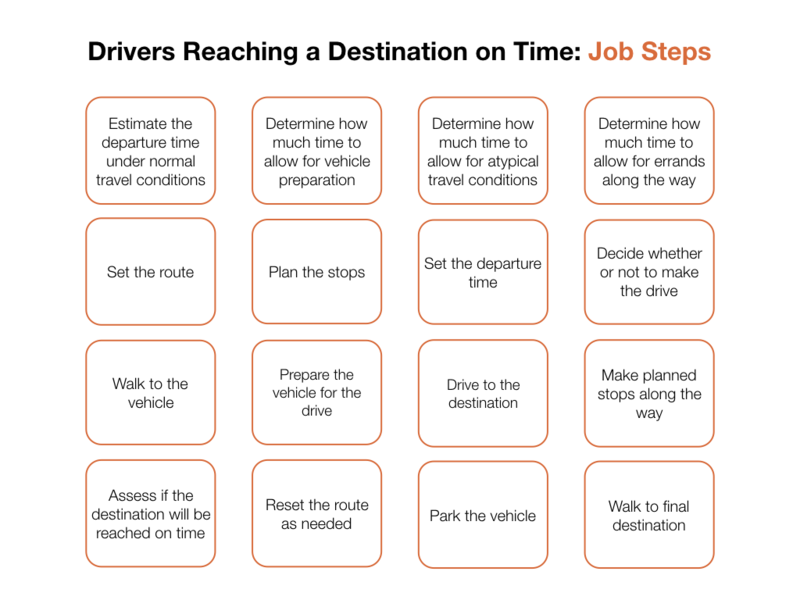 In all there are sixteen steps in "get to a destination on time:"
Next, we identify the customer needs in each job step. The needs are the actions the job executor must take in order for the job step to be completed successfully. The faster the action is completed and the more accurate the outcome of the action, the more successful the job step will be and the more satisfied the customer will be. In other words, needs that can only be met slowly and inaccurately with the existing solution will cause the customer to be dissatisfied. If your customer cannot quickly and accurately determine this information, she cannot plan her stops in such a way that she will reliably reach her final destination on time. The job will go off track, causing anxiety. To validate the job steps and needs, you can interview job executors. To validate your assessment of whether or not the job executors are dissatisfied with their ability to meet the needs, you can survey job executors on their importance and satisfaction of each need. To figure out why your detractors, specifically, are dissatisfied, you can have them take your needs survey. The needs that have low satisfaction ratings will give you a precise problem to solve that will increase the satisfaction of your customer and turn your detractors into promoters. Now that we know the problem--the unmet needs in the job-to-be-done--how do we come up with a solution that will be good enough to turn our detractors into promoters? The first step is to analyze the existing solutions in the market--not just your obvious competitors but any product, service, or manual process someone can use to get the job done. Instead of doing a feature to feature comparison between your products and your competition, you look at how long it takes to satisfy the unmet needs in the job and how accurately customers can do it with the existing solutions. The speed and accuracy of satisfying the need with the existing solutions is the benchmark you need to beat with your new product or feature idea. If your new idea is not faster and/or more accurate than the benchmark, there is no reason for job executors to switch to your solution. Time to think of another idea. Once you do have an idea to satisfy the need faster and more accurately, you can check-in with your customers at various intervals in your product development process--idea stage, prototype, post-release, etc. Ask them how satisfied they are with their ability to meet the targeted needs with this new feature. If they answer with more satisfaction than they did before seeing the new product or feature, then you are on your way to transforming the detractors to promoters. NPS is a useful tool for tracking customer satisfaction. However, to take action against the results, it's extremely helpful to have a method like Jobs-to-be-Done to specify the cause of the dissatisfaction and create a plan to turn your detractors into promoters. If you haven't already, take a look at the Cicret Bracelet video. In just over two years, it has over 25 million views on YouTube. It's a water-resistant bracelet that projects your smartphone's screen onto your arm. 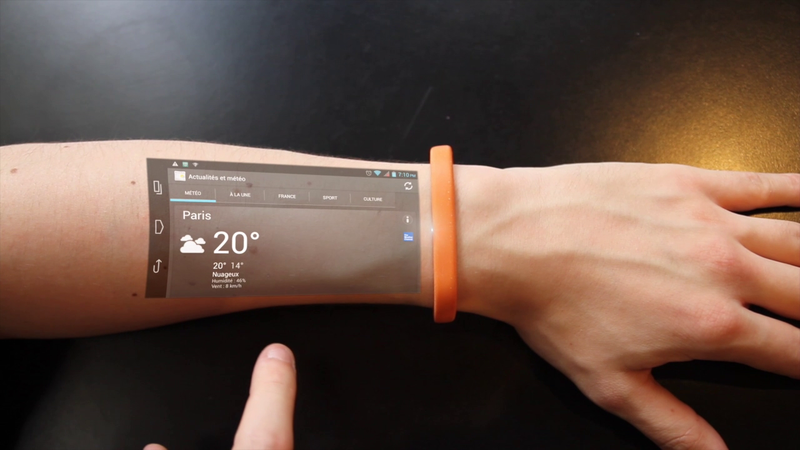 Advertised as a "tablet for your skin," the not yet released Cicret Bracelet is clearly garnering attention. But will people buy a Cicret once it's launched? In other words, will sales grow as fast as their YouTube views? In order to answer such questions at thrv, we use Jobs-to-be-Done, a product innovation theory popularized by Clay Christensen of Harvard Business School. The key idea is, "Your customers aren't buying your product, they are hiring it to get a job done." The question that leads to understanding Cicret's potential is, "What job would you hire the Cicret Bracelet to do?" According to the product video, the answer is interface with your smartphone. Purchases occur when people struggle with getting a job done. Does anyone struggle enough with interfacing with their smartphone to buy a new product? In other words, are there unmet needs in this job? Cicret's product video opens with someone using the Bracelet in the bath tub. This speaks directly to the unmet need on which Cicret should focus its marketing message in order to realize high-growth sales: reduce the likelihood that the conditions of your environment prevent you from using your smartphone. In order to sustain its growth, Cicret will need to take a lesson from Salesforce and expand beyond satisfying needs in a consumption job to getting their customers' functional jobs done better. Wait! What are consumption jobs and functional jobs? Consumption jobs are the tasks required to use a product. These are all "consumption jobs." They are important, and companies have seen rapid growth by making progress against them. However, consuming a product is always in service to some larger goal a.k.a. "a functional job." Markets exist because people need to execute functional jobs. Even though Cicret will eventually want to focus on helping its customers achieve functional jobs, the company can get fast initial growth by serving an unmet need in the consumption job. Cicret can then use their momentum and resources to find new ways to satisfy customer needs in the functional job better than the existing solutions. Salesforce is a great example of a company that went to market with a focus on serving needs in a consumption job. As the first cloud CRM, it didn't require an on-premise installation. Salesforce got the "install" consumption job done far better than its competitors. On-premise software installations were slow and expensive. To "install" Salesforce, its customers just had to create an account on a web site. The Salesforce "installation" took minutes, blazingly fast in comparison to the days or weeks it took to install their competitors' software. Salesforce made this advantage a central part of their marketing, calling for "the end of software" and making "no software" a key part of their logo. In the process, Salesforce enjoyed hockey stick growth and invested the proceeds in getting the functional jobs ("acquire customers" and "retain customers") done better than their competitors by adding key functionality through product development and acquisitions. Cicret can follow the Salesforce playbook by focusing its launch message on the needs in the "interface" consumption job, rather than its novel product features ("tablet for your skin"). If it works, they can follow-up on their early success by investing in satisfying unmet needs in the functional jobs. How does knowing the job and needs help Cicret with marketing? Philip Kotler, a marketing expert at Northwestern University's Kellogg School of Management says, "Marketing is the science and art of exploring, creating, and delivering value to satisfy the needs of a target market at a profit." This advice is really helpful if we understand what a customer need is and have agreement across the organization. What is a customer need? Do your colleagues at your company agree on your customers' needs? Jobs-to-be-Done defines a need as "a metric customers use to judge how quickly and accurately they can execute a job." We structure each need with a direction, metric, and goal. To identify them, we interview people who are trying to execute the job, asking, "What's difficult, frustrating and time-consuming about executing the job?" This definition, structure, and method for identifying needs gives teams an unambiguous, measurable problem statement around which everyone can align. What need does Cicret serve? "Reduce the likelihood that the conditions of your environment prevent you from using your phone." This is a need in the consumption job "interface with a smartphone," and the Cicret Bracelet does it better than any other product so far. The bath tub shot at the beginning of Cicret's video positions their product as serving this need. If the marketing continues in this vein, it could achieve high-growth at launch. You're playing basketball and the phone is next to your gym bag. You're waiting on an important email, but instead of running over to your bag to check your phone, you can bring the screen up on your arm during downtime on the court. Your cycling to an unfamiliar destination, which means you need the help of a navigation app. It's inconvenient and unsafe to pull out your phone, but the Cicret Bracelet allows you to glance down at your arm each time you need to check directions. You've just arrived at a concert. You're looking for a friend, but it's crowded and you don't want to drop your phone on the ground when there's a human stampede around you. Simply text your friend right on your arm with the Cicret bracelet. You're eating chicken wings, and your hands are covered in sauce. Use the Cicret rather than getting your phone greasy. All of these images can deliver the message of how Cicret satisfies a customer need. How does Cicret beat the competition? 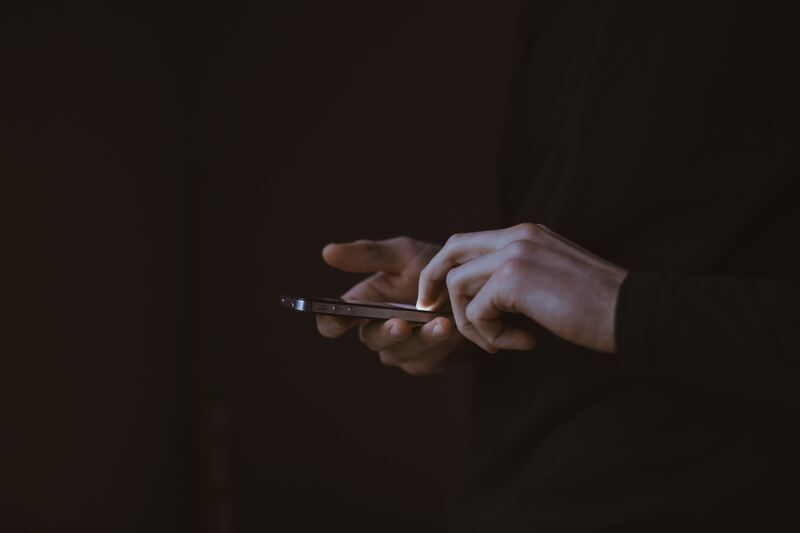 In tackling this unmet need Cicret goes head-to-head with smartwatches, which also reduce the likelihood that the conditions of your environment prevent you from using your phone. Smartwatches have been struggling to sustain growth as most have failed to move beyond the novelty phase. Cicret's marketing can speak to how its larger display and waterproof design serve needs in the job better than a smartwatch. Meeting a need better than your competition drives growth. Cicret has an opportunity to outpace smartwatches by demonstrating how interfacing with your smartphone is easier with a Bracelet than it is with a smartwatch. Meanwhile, Cicret will need to keep their attention on Garmin and Apple as they develop fitness trackers and health apps that depend on smartwatches. This work leads the way to smartwatches getting functional jobs done. If Cicret fails to get functional jobs done better, instead of following Salesforce's path, they will fall far behind the competition. Marketing to an unmet need in a consumption job can resonate with customers and help companies get off to a great start. It is then critical to invest in the functional job to have a long-lasting business. In 2011, IBM found that drivers in cities around the world spend an average of 20 minutes finding a parking spot. 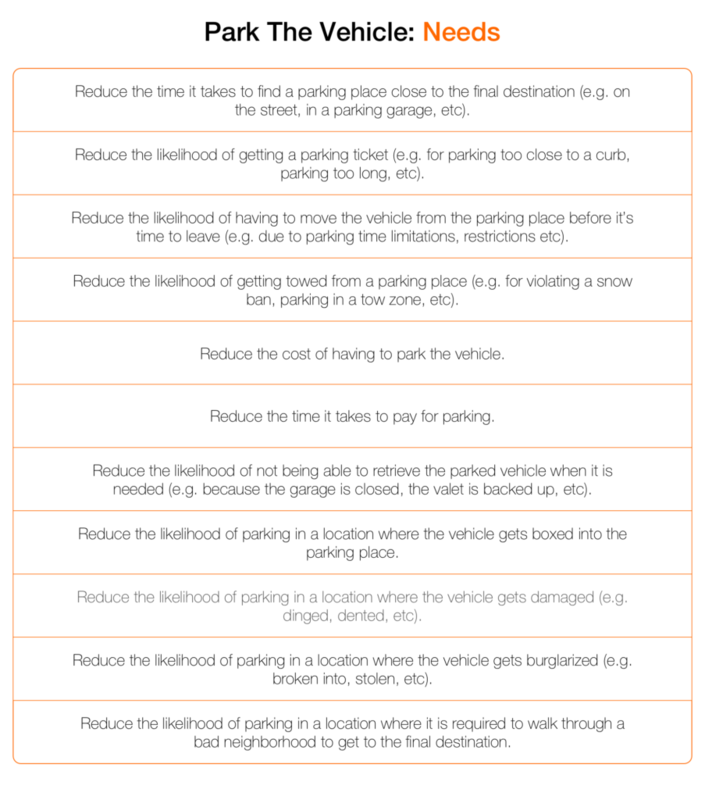 Such studies highlight the need for more efficient parking. Entrepreneurs and companies have been taking steps to solve the parking problem for some time now. There are many parking apps out there, yet no clear winner. It's still extraordinarily difficult to park in major cities. Drivers are frustrated. Any company that can make it fast and easy to find a parking spot is likely to grow very fast. So, it's no surprise that the world's second-largest company by market cap, Alphabet (aka Google), has joined the game. Google has introduced a parking difficulty function to Google Maps, allowing drivers to see if parking availability in a specific area is limited, medium, or easy. The parking difficulty icon is certainly a cool function on its own, but it's part of a much larger goal. To understand this larger goal, let's consider the parking difficulty function through the lens of the Jobs-to-be-Done Theory, which was popularized by Clay Christensen of Harvard Business School. Christensen says, "customers aren't buying your product, they are hiring it to get a job done." What job would someone hire the parking icon to get done? Well, it helps drivers park a vehicle. But, why does anyone need to "park a vehicle?" Unless you're a valet or you live in a city with street cleaners requiring alternate side parking rules, you don't wake up in the morning thinking, "Gee, I have to park my car today!" The reason you park a vehicle is so you can go to your destination. So "park a vehicle" is a job step in this larger job: reach a destination on time. With Google now making moves to address problems with parking, what can car-parking apps like SpotHero and Luxe do to stay successful? After all, if Google gets this job step done along with many of the other steps in the job, it won't be long before people stop using SpotHero and Luxe for parking because Google is getting the whole job done for them. Jobs Theory helps us see options for services like SpotHero and Luxe to stay alive. Using Jobs Theory, we can define the market based on the customer's job-to-be-done, which is "reach a destination on time." 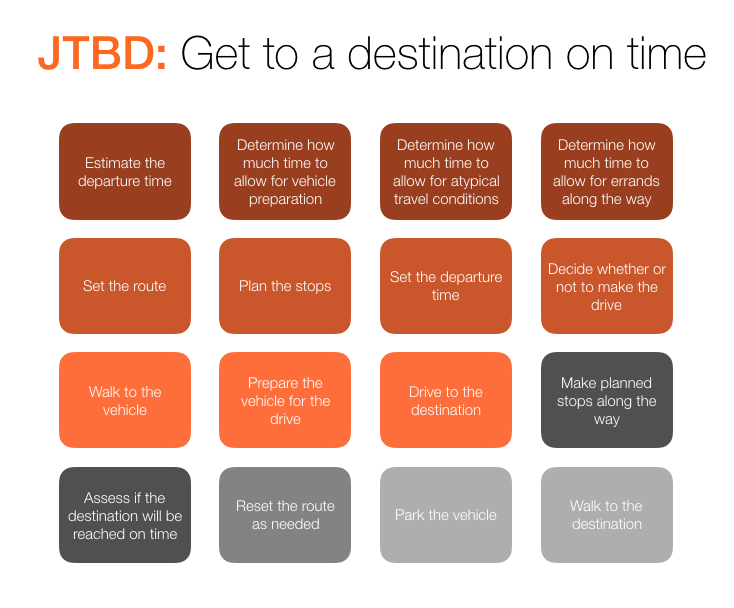 Reaching a destination on time is a functional job, meaning that it is a key goal or task that people need to accomplish in their personal or professional lives. The market for the job of reaching a destination on time exists because many people need to execute this functional job frequently. The company that gets this job done better for customers will win the market. Companies like SpotHero and Luxe complete the job step of parking the vehicle for the customer, but remember that customers must get the whole job done (reach the destination on time). This means companies fulfilling the job step of parking the vehicle aren't just in competition with each other, but also with any service that gets any other steps in the job done, which means parking apps have more to worry about than each other. Obviously, this broadens the competitive landscape. It's crucial for companies like SpotHero and Luxe to see and address this risk. Because bigger companies that are fulfilling other job steps may come in and start fulfilling their job step as well (i.e. Google), which could put them out of business. Even Tesla's self-driving cars are competition for parking apps. Not only do these driverless cars handle steps like setting the route and planning the stops, they also self-park! If driverless car makers also figure out how to get autonomous vehicles to find open spots, no one will need to use other apps. The overall leader in the market of reaching a destination on time is Google, with Uber and Tesla making strides. Any one of these tech giants, and others like Apple and Lyft, present a threat to parking apps. Now that Maps serves needs within the parking job step, like reducing the time it takes to find a parking spot close to the final destination, the tech giant has extended its lead. 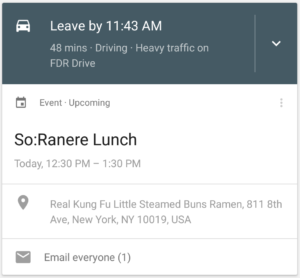 Also, in addition to Maps, you also have things like Google Now and self-driving cars. All of these are working together to help Google do more job steps for reaching a destination on time. Considering everything Google is doing to complete the job of a reaching a destination on time, it's clear the company has a lead. The launch of its parking difficulty icon puts them even further ahead of competitors. No other solution completes the job better than Google's overall ecosystem. There are a host of parking apps in the market, and some do complete this job step quite well. For instance, BestParking helps drivers park a vehicle quickly by locating the most convenient garages, and Parker helps drivers find paid parking and navigate street parking rules. But while parking apps may do their job step well, they need to be aware that giants like Google are competitive threats, as they are already completing many of the steps for getting to a destination on time. This should be concerning for parking app developers. If drivers can set the route, plan stops, assess if the destination can be reached on time, and find a parking spot all within one app (Google Maps), why would they open up another app just for parking? Are you working on a job step that much bigger companies will target soon because they're already fulfilling other steps in the job? If so, what does the larger company fail to do well? Answering the first question involves employing JTBD Theory to see all the jobs steps within a job. Again, parking is one step to completing the job of reaching a destination on time. Once you know about the potential competitive threat to your job step, you can make plans to protect yourself. This necessitates first improving upon the existing job step you complete, and then attempting to fulfill other jobs steps (especially those competitors don't do well). The first solution parking apps have is to improve on what they already help customers do: Park the vehicle. If they are able to do this ten times better than Google, then users most likely won't abandon the app. The key to doing this lies in recognizing and solving customer needs. If you don't define and identify these customer needs, then you are guessing about what they want. A customer need is a metric customers use to judge how quickly and accurately they can execute a job-to-be-done. For reaching a destination on time, there are lots of needs that must be satisfied. If a parking app can satisfy most or all those needs efficiently, they will be able to protect themselves from being overrun by a big company that comes in to do the job step. To do this, parking apps should first identify where competitors' weaknesses in the job step are (i.e. what needs do they fail to satisfy). Then, they should see if solving these unmet needs carries enough opportunity. For example, Google Parking does reduce the time it takes to find a parking place close to the final destination, but it doesn't reduce the likelihood of parking in a location where the vehicle gets damaged. Solving this unmet need actually has lots of opportunity, as customers report low satisfaction for this need but rate it as highly important. So, a feature that guides users to parking spots where it is less likely to get the car dinged or dented could help apps stay ahead of Google in the parking job step. Solving more needs of the parking job step quickly and accurately could allow you to have sustained success. It could also set you up for acquisition by a big company. For example, Waze served the need of "reduce the time it takes to determine if an alternate route should be taken to save time due to unexpected travel conditions" within the job step "reset the route as needed" so well that Google decided to purchase the map app for $1.2 billion in 2013. Still, even if you do that one job step substantially better than the competition, it might not be enough. After all, customers will still have to hire other solutions to get the job done. That means you have to work on getting more steps in the job done. Do more job steps. Waze, by crowdsourcing construction and traffic, is able to help drivers determine how much time to allow for atypical travel conditions, in addition to setting the route (note the company accomplished this before Google acquired it). Use existing assets to tackle other jobs. While working on parking, a company may have developed other technology or operational assets that can get steps in other jobs done. For example, Uber is using its assets to tackle the job "get something to eat" with UberEats. This job is adjacent to their primary focus. It can be extremely daunting when a large company puts you in their sights. But, once you understand all of the unmet needs in all of the job steps of your job or find adjacent jobs you can tackle, you will have opportunities to stay alive. Look for ways to satisfy more needs in the job step so that you stay far enough ahead of all competition. Find ways to expand on the job steps you do so that you can get the whole job done faster and more accurately. Find adjacent jobs to which you can apply your existing assets. These three steps can help you stay relevant over time, even if a Goliath is coming for you.